"I now feel like a million bucks..."
"Today may daughter told me ‘Mommy this is the first day in so long I don't hurt’ Which made my heart melt and I am so thankful to Dr. Greg!" "Even after seeing Dr. Arnold only once, I began to feel much better." "In just a few visits, I felt a complete change..."
"...very much helped our kids." "Dr. Arnold is always accessible for any follow-up questions or concerns..."
"Dr. Arnold explains explains his technique so all involved can understand. That helps me as a father to practice with my son at home." "I woke up without neck pain for the first time in weeks!" "Dr. Arnold is a true professional who really cares about his patients." "I could see the difference in my son after just one lesson." "...within 3 visits my son's shoulder felt greate and was getting better by the minute." "...our time with Dr. Arnold has been nothing short of great." "I went from being hurt for 2 years to my old form within 2 months." "...helped my hip get better in less than 24 hours." "Dr. Arnold always keeps the instruction understandable, relatable, simple...He is always asking my son questions during the lesson to keep him engaged and focused." "1 visit was all it took..."
"He takes the time to explain and make you feel at ease..."
"...truly amazing and enjoyable from a parents' perspective." "...he cares about the patients he works with and follows up." 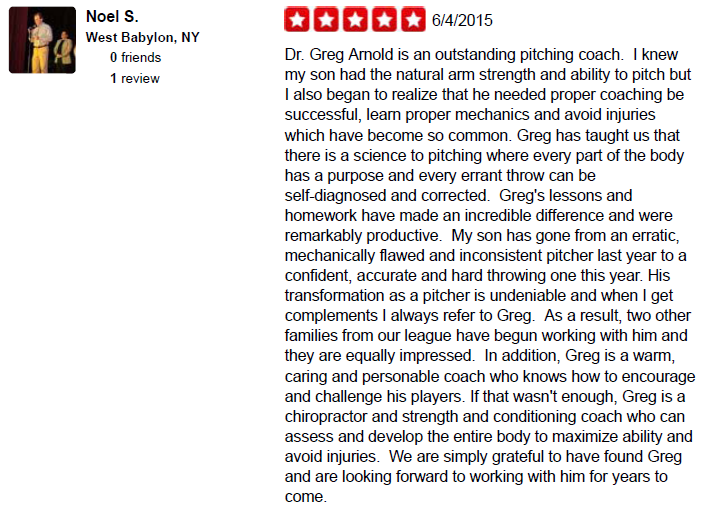 "Dr. Arnold has a passion for what he does..."
"Within a few session I saw a major improvement in my son's mechanics." "After just 2 visits, I had felt much better and pain-free." "Dr. Arnold's knowledge and attention to detail...is amazing!" "You can tell Dr. Arnold truly cares about his patients." "Dr. Arnold's personality and knowledge make the whole experience relaxing and impactful." "...the first one to truly take me out of significant pain." "...my feet feel better than they have in years." 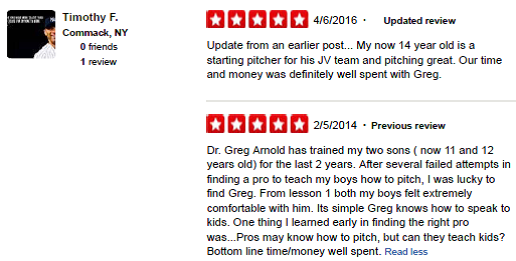 "Dr. Arnold is a true professional..."
"Dr. Greg is great with the team, he knows how to talk to kids and get them to listen." "...I was not able to throw a baseball at all. Then I found Dr. Arnold...and progressively over a few weeks I found myself back to throwing 100%." "My son improved significantly in only 2 months. It was great to see him the season on such a high note." 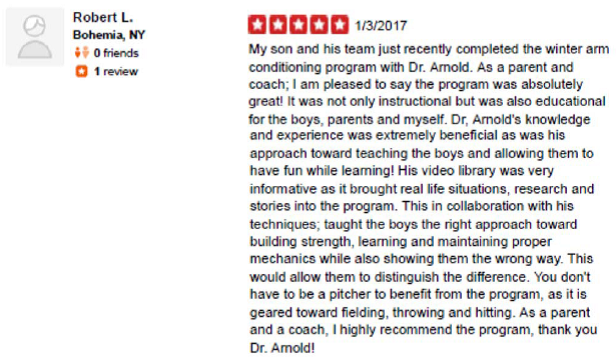 "Dr. Arnold's knowledge and experience was extremely beneficial as was his approach toward teaching the boys and allowing them to have fun while learning!" "Fixed a bad knee that I thought would require surgery..."
"I went from having pain every time I sit down to barely have any pain at all." "...Dr. Greg patiently explains the process that he is using." "...my son was completely relaxed and comfortable with treatment." "Thank you for a better quality of life." 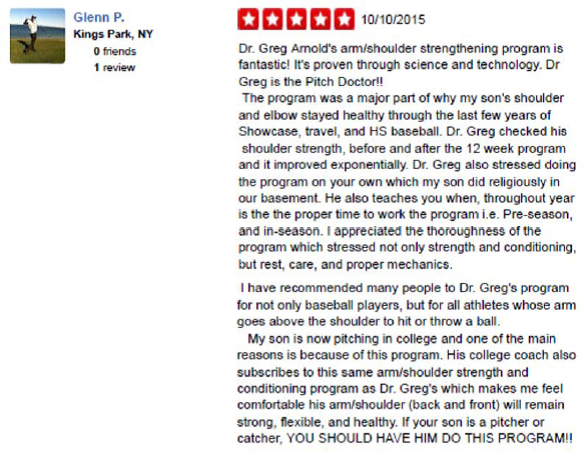 "...an invaluable resource to young ball players..."
"Suffered with neck pain for more than 6 years...Dr. Arnold treated it over 6 visits..."
"Dr. Arnold really takes the time to properly train my son..."
"I instantly left with more range and less pain." "I wish I hadn't waited so long!" "I have seen tremendous results from when I started." "I walked out...instantly noticing a difference!" is a level of confidence he has never had on the baseball field." "...highly recommend for baseball-related training and health maintenance." "I haven't felt this good in many years." "Dr. Arnold was professional, knowldgeable, and most importantly - positive and patient." "...worth the trip from anywhere if you are a serious player." "The best chiropractor I ever went to!" "My family trusts Dr. Arnold with our children's care." "Dr. Arnold makes you feel like you're at home." "I always leave feeling better." "Dr. Arnold finds the time to make his patients a priority." "Dr. Arnold listens and educates." "It was well worth the timing and money to step out of my comfort zone and try something new." 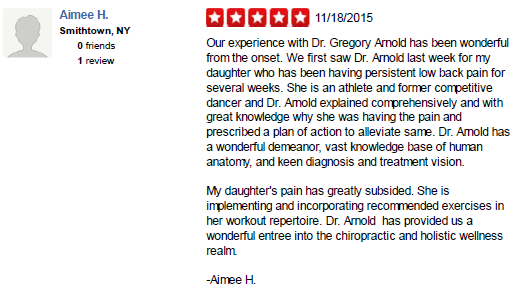 "Dr. Arnold really takes the time and genuinely wants to see you get better." "Thank you, Dr. Arnold. I am truly impressed." "Dr. Arnold explained every aspect of his treatment and welcomed questions." 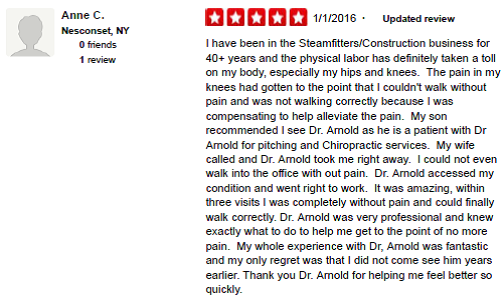 "...within 3 visits I was completely without pain and could finally walk correctly...my only regret was that I did not come see Dr. Arnold years earlier." 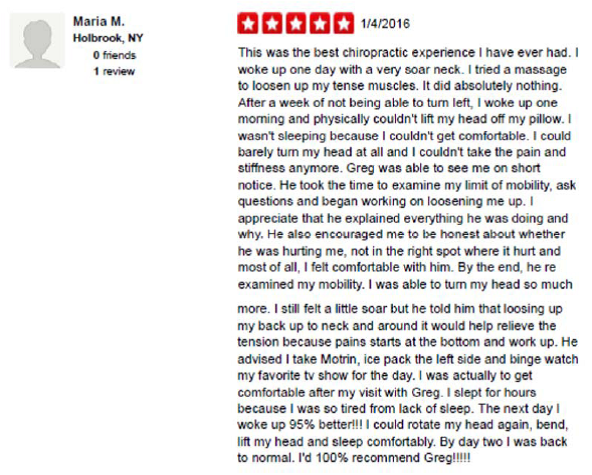 "...the best chiropractic experience I've ever had...the next day I woke up 95% better!" "Dr. Arnold kept in constant touch with us to see his progress and was very easy to talk to as well as very professional." 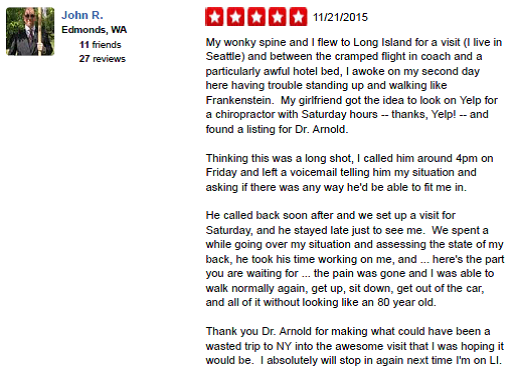 "Dr. Arnold was able to spot the issue and help me right away!" "...helped determine the cause of my injury and got me back to running quickly." "...very happy with the results..."
"Thank you Dr. Arnold for making what could have been a wasted trip to NY into the awesome visit that I was hoping it would be." "Greg is a very detailed-oriented doctor who takes time and genuinely cares about his patients." "Dr. Arnold explained comprehensively and with great knowledge why she was having pain and prescribed a plan of action...My daugher's pain has greatly subsided." "Any problem I've ever had Dr. Arnold always finds the root cause of the issue." "Dr. Arnold...uses an interactive approach that keeps the class engaged and focused the entire time." "Very calm setting and Dr. Arnold is...very reassuring when it comes to...what to do for the pain during the healing process." "Dr. Arnold gave us the cause and a solution moving forward and also has a program to keep my son on the mound pain-free." "My son is pitching in college and one of the main reason's is because of [Dr. Arnold's] program." "Dr. Arnold was able to alleviate all the pain in my hip in a few days and identified issues causing my constant knee pain." "This is the first time in many years I have had major relief." "After several adjustments using muscle stimulation and various masssge techniques I notice a real difference." "Dr. Arnold makes sure that you're feeling better before leaving his office and he even keeps in contact to make sure you're doing well in the days that follow." "I have never been to a doctor that was as concerned for his patients' well-being as Dr. Arnold." "A few sessions in I was as good as new!" "My son has gone from an inexperienced pitcher to being first in his rotation on an extremely competitive travel baseball team." "Dr. Arnold knew exactly where the problems were coming from a how to treat them, his care and concern shows with his follow-up texts/phone calls." "After just 5 visits with Dr. Arnold, I feel tremendously better. I'm no longer waking at night and I can turn my head without pain." "I've been having problems with my back for five years, and after every visit I can definitely feel a difference." "Within a few sessions, and the exercises Dr. Arnold gave me to do, I was feeling much better. Within 1 week, I was able to go swimming and walked 3 miles with no pain." "Not only did Dr. Arnold help me physically but also showed genuine concern and actually followed up with me days after treatment." "After the first visit, I was already starting to feel better." "Thanks again Dr. Arnold for taking such great care and concern for our son." "My son really learned a lot from Greg, he took a little boy that was throwing the ball toward the plate and made him a pitcher. He is so far from where he started at the beginning of the season. This year was fun watching him grow." "With 3 lessons in...[my son's] confidence is so high we can't wait to see Doc again. This was by far the best move I could have made for him." "My son has gone from an erratic, mechanically flawed and inconsistent pitcher last year to a confident, accurate and hard throwing one this year. His transformation as a pitcher is undeniable...We are simply grateful to have found Greg and are looking forward to working with him for years to come." "Dr. Arnold was fantastic with my 13 year old son...He took the time to explain in detail why his injury may have occurred and how to prevent it in the future." "I was referred to Dr. Arnold being told that his abilities may help my 20 yr. old son who was struggling with foot injuries for over a year and a half. We had already been to several physical therapists, two orthopedic surgeons and a chiropractor. I thought how could a 'pitching doc' be of help for a runner with a chronic tendon injury of the foot? I couldn't have been more wrong. Not only was Dr. Arnold receptive to his injury he knew right away what needed to be done...Dr. Arnold had him back to running by the end of the week, eating much better and added in additional supplementation. His level of caring and knowledge was amazing. We can not be more grateful to Dr. Arnold for doing what he knows best and we will certainly continue to use his services and will not casually recommend him but insist that anyone with an issue get into his office and include his treatment on your road to recovery." "Dr. Arnold was constantly staying in touch and following up via email in an effort to tweak the treatment and ensure I received the most effective care he could provide." 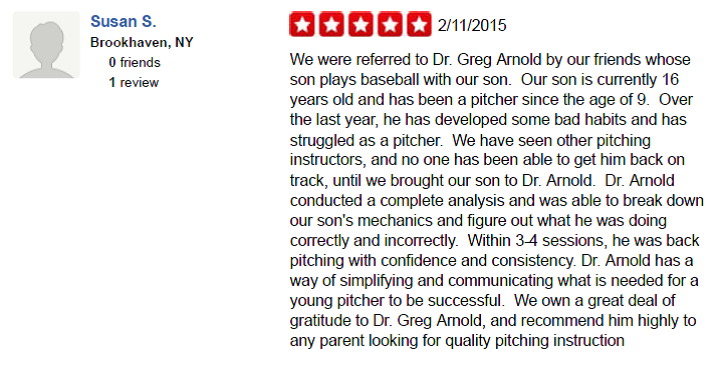 "We have seen other pitching instructors, and no one has been able to get our son back on track until we brought him to Dr. Arnold...Dr. Arnold has a way of simplifying and communicating what is needed for a pitcher to be successful." 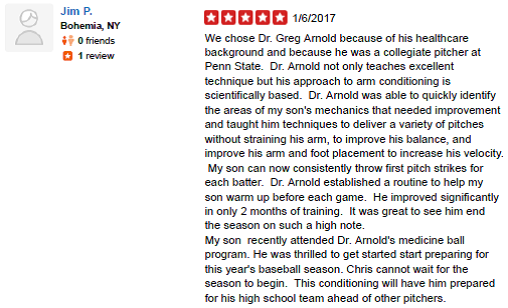 "After only a few lessons Dr. Arnold was able to correct the things my son was doing wrong and not only did my son understand his theory, I was able to see tremendous improvement on the field." "Dr. Arnold was able to diagnose my problem very quickly...he healed me within 3 visits!" 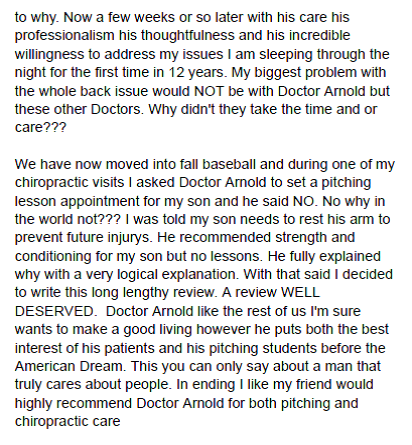 "My son had never been to a chiropractor before and was a little hesitant...Dr. Arnold immediately made my son at ease...continued to check up on him until he was 100% better. 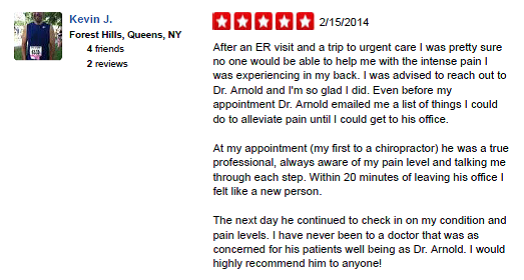 It was a such a comforting feeling to know that Dr. Arnold really cares about his patients." "A few weeks or so later...I am sleeping through the night for the first time in 12 years." "I had back issues that he corrected within a couple of weeks and a long-term elbow injury...and after weeks of treatment, my elbow is feeling great!" 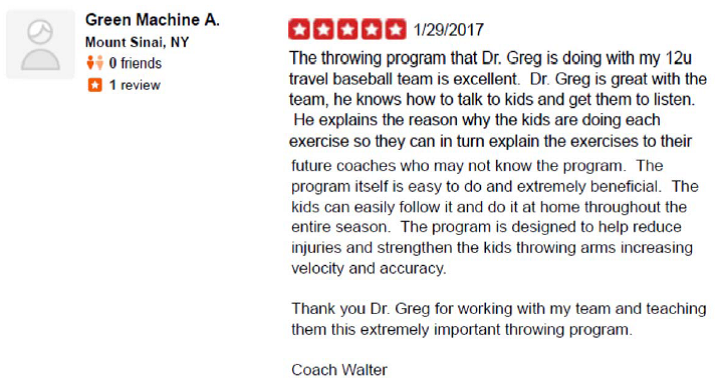 "...we owe a lot to Greg, not only for his pitching mechanics knowledge, but his fervent protection of our son's health." "My results are wonderful! I have pain relief!" 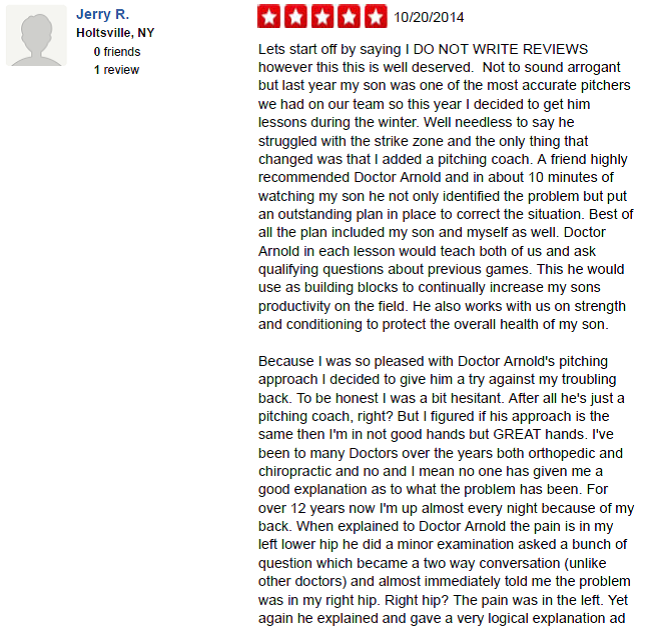 "Dr. Arnold corrected a lot of my son's flaws and made the time they spent together fun while building his confidence." 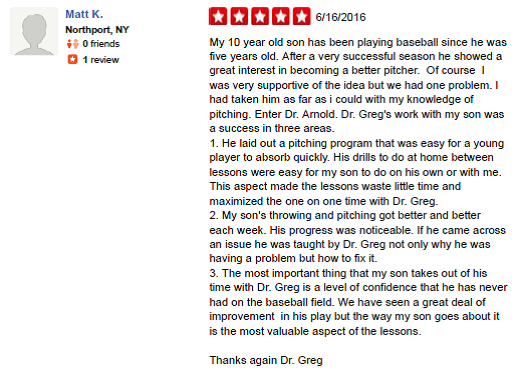 "After a second pitching lesson my son was back on track, and NEVER pitching better!!" "Even though it's only been a few lessons, it's AMAZING the difference it has made. 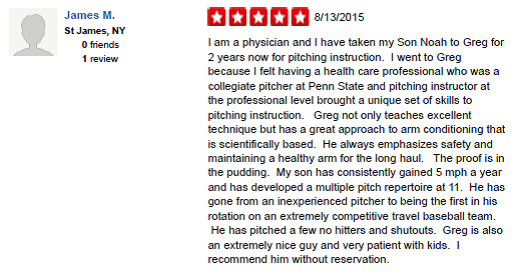 Dr. Greg's pitching knowledge and medical background seems to be an amazing combination." "I felt so much better instantly...The pain was gone, and right away I felt like I was walking better." "I had knee problems for years and though it was just a hereditary thing...After just 3 visits, my knee feels amazing now." "Besides being very personable, caring and knowledgeable, [Dr. Arnold] answers every question so the lay person understands what's being done." 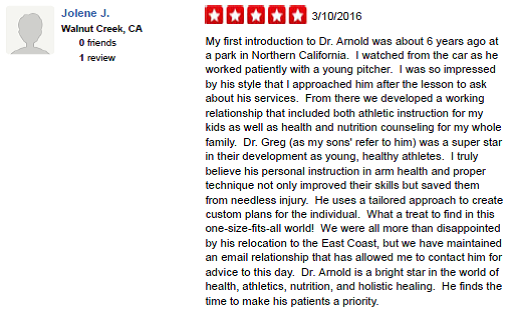 "[Dr. Arnold's] knowledge and experience with baseball made my son feel completely at ease [during treatment for his arm pain]." "At no point in my life have I ever felt as good as I have now, and credit goes to [Dr. Arnold's] treatments." "Dr. Arnold had become our Chiropractor...his bedside manner was impeccable!" "I would recommend every young pitcher see [Dr. Arnold] to avoid injury." "Dr. Arnold communicates extremely well with teens/young adults and is missed by all his former patients [in California]." "I am so happy and impressed with the level of coaching and care Christian has experienced with Dr. Greg. I trust technically and medically he is in great hands with Dr. Greg." "I can reassure if I didn't come to see Dr. Arnold, I would be one big mess." I can honestly say that none of my previous treatments with previous chiropractors compares with the relief I felt this morning after our session yesterday. I feel like an entirely new man with none of the stiffness I had been growing accustomed to. I look forward to continued sessions with you to continue correcting the alignment in my back. Thanks Doc!" "During the 2005 baseball season, my 12 year-old Sam developed tendonitis in his throwing elbow.He was playing as both a pitcher and position player in Little League at the time. As an active family which has also experienced serious chronic health problems, we are careful consumers of medical care. In addition to Dr. Arnold, we visited two of the region's leading chiropractors to choose a practitioner and determine how best to treat Sam's injury. We selected Dr. Arnold because of his professional expertise, his focus on preventing further injury, and his ability to relate effectively to our son. Greg treated Sam for several weeks.He took Sam's injury very seriously, and he probably held him out longer from returning than other practitioners would have. Sam experienced a minimum of pain, and he has not even had a hint of any further discomfort or injury. I have recommended Dr. Arnold without hesitation to friends and colleagues as a chiropractic practitioner. Although he is early in his career, he is mature in manner and professional in practice. I especially recommend him to active athletes and to youth clients. As an athlete himself, he understands and focuses on restoring performance.However, he is extremely careful about managing and preventing further injury. After a week of camping and a lousy hotel bed, I developed pain in both shoulders, loss of motion, and numbness in one of my forearms. So I went to my regular chiropractor, not Dr. Arnold. I got my two adjustments and had no relief. I then went to my regular medical doctor. He wrote me prescriptions for an anti-inflammatory and for physical therapy. I knew this was only masking the pain and not getting to the root of my problem. Still without relief and many sleepless nights, I went to Dr. Arnold because was recommended to me by a friend. I thought "just another chiropractor and another adjustment". I was wrong. I sat down for my initial consultation and described my problems. The next thing I know, he breaks out this mid-evil tool set, which I later learn are called Graston Tools. This newer therapy called the Graston Technique solved my problems. That night I got the best sleep in days and it has been getting better ever since. I received four treatments over a two week period. My pain significantly improved after the first two treatments. The range of motion increased and the forearm numbness disappeared. I went from sleeping four hours a night to my regular eight hours. Dr. Arnold is only one of two people in the area that uses this technique. The Graston Technique along with Dr. Arnold's care and compassion worked for me. He took a personal interest in me as a patient. In this age of fast and more, I am glad to say Dr. Arnold takes his time and solves the problem correctly from the start. "The pre-season orthopedic exam that Dr. Arnold performed on our 12-year old son was extremely beneficial. 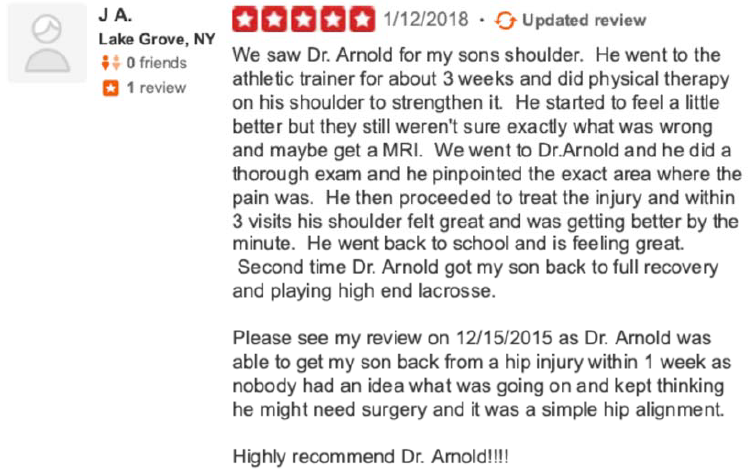 Dr. Arnold was very thorough in examining his back, shoulder, and range of motion and demonstrated specific exercises and stretches that will prepare him for his little league season. 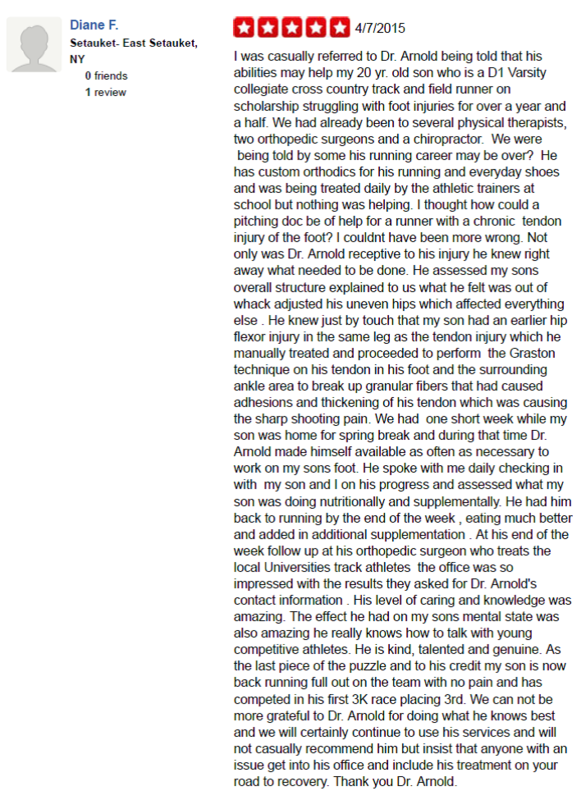 Most importantly, we feel that Dr. Arnold truly cares about the physical well-being and athletic success of our child!" 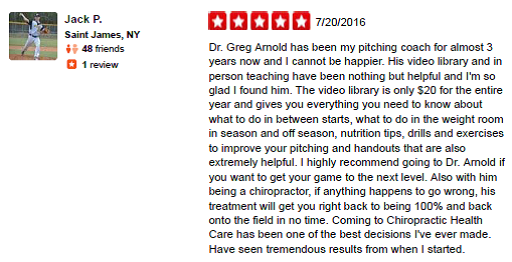 "I would highly recommend Dr. Arnold to any player looking to improve his pitching skills. The techniques and drills Greg used with my son's development were instrumental in giving him self confidence in pressure situations. 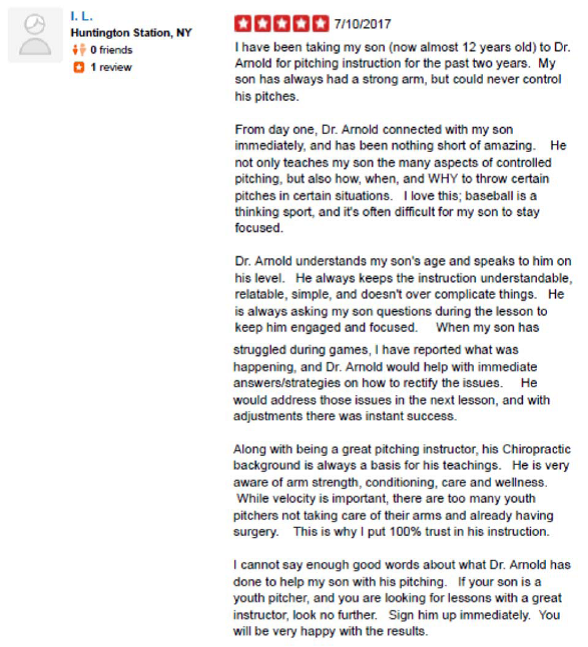 The work Dr. Arnold did with my son was one of the reason's my son made the all-stars. After viewing the progress my son made several other parents on our team signed up with Greg and their game drastically improved after only 3 lessons. Dr. Arnold's class is a must for any pitcher who wants to learn how to do it right the first time, every time. "Dr. Arnold is one of the few certified instructors in the well-respected House training method. Our Little League team this year had several pitchers with a variety of styles and abilities. I asked Greg to conduct a clinic for our pitchers and due to his effectiveness and popularity, the families of the team's pitchers then contracted with him to conduct ongoing lessons. Greg enabled them to develop more effective mechanics and consistent performance. He also stressed injury prevention and nutrition issues which are often neglected for youth athletes. Greg excels as a pitching coach for the same reasons that he is a skilled practitioner. He is thoughtful and attentive with clients. He emphasizes a systemic, holistic approach to care.He blends performance enhancement with injury prevention. He focuses clearly on mechanics and technique. And he relates well with both adults and children." 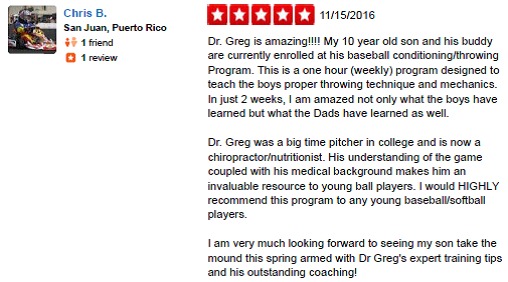 "We not only know first-hand that he's a great coach, but Doc is truly one of the most qualified pitching, baseball, nutrition and conditioning professionals out there. The feedback from the kids taking lessons from him as well as his conditioning classes this last year were top-rate." "I can't say 'Thank You' enough for the time you spent with me sharing your wealth of knowledge. It is so unusual these days for the kindness you showed me. Thanks a million." "My 12 year old son attended the camp and I was extremely excited with the results. My son Alex went from 176 pounds to 150 pounds and made the weight for football. He developed strength, endurance, and learned how to eat healthy. Dr. Arnold went the extra mile to change my son's life forever!" "My 13 year old son has thoroughly enjoyed Dr. Arnold's summer conditioning class. He has learned about body fat, testing his strength, eating and drinking proper foods and has had a lot of fun while learning. He is excited after seeing his body strength changes on paper after the testing on Monday's. No other teacher has presented information to my son in this way where he understands the results and cares about them too! Dr. Arnold has been a wonderful influence and great male mentor for my son. I highly recommend his conditioning course." "My 13 year old son Nick had a great time at your camp. It was one of the few camps he's ever been to where he looked forward to going and didn't complain and seemed a lot more interested in the ways of exercising and eating right." "James had a great time staying in shape and improving his physical skills."